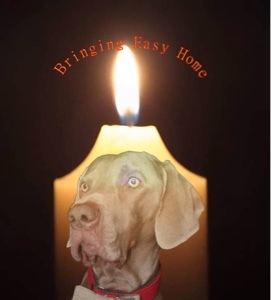 I am sharing this candle for Easy to join the Blogville circle of love for this beautiful boy and all those who have crossed the Rainbow Bridge this year. I did not know Easy but I know how much he was loved. My peeps found a quote that said the life of a candle is not short if it is used to light other candles and those who have given so much joy and love will be remembered always by those whose lives were brightened by their presence. RIP Easy and love and hugs to his family and friends. What a lovely tribute to Easy....he had a heart the size of Texas and Alaska combined. We absolutely love the quote your folks found. Purrs and hugs to all who lost loved ones 2 and 4 legged. OH MOTH... what a Grand Post this is. Easy was a great guy and has left pawprints all over Blogville. Thanks for helping us honor him and those who left this year. Such a wonderful tribute to a beautiful friend! A sweet post! We didn't know Easy but we're sure he will be remembered by many.